One way to sell more print ad space is to encourage your advertisers to add a campaign and magazine specific URL to their next print ad. It is one extra step. But here is what happens; a readers sees the ad and is motivated to search the Internet for more information. By using a campaign and magazine specific URL the advertiser can track which campaign and which magazine drove the reader to their website. Now add the magazine initials or just a number to designate a specific media and your client can have it all. Is it better to use a custom campaign URL or extensions of the brand URL? Using the brand URL, of course, reinforces the brand. Which approach is better? The answer: the one that gets your advertiser to include a magazine specific reference so your media gets tracked! You gotta love it! Here is a print ad for McDonald's Big 'n' Juicy Burger that uses almost no ad copy and a lot of paper to communicate how their bigger hamburgers need bigger napkins to handle them. 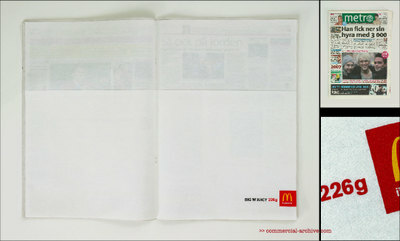 The double page spread was printed on napkin paper and ran in Sweden's Metro newspaper to promote the idea. Is paper based ad messaging dead? I don't think so! You sell an on target media program only to see your client, a small or mid-sized advertiser create bone-headed ad creative so self-serving and uncommunicative it will surely fail. You can see the train wreck coming. When the ad campaign bombs in the pages of your magazine or web media you will loose the business, your fault or not. Speak up and you could be seen as ungrateful and critical. Here is a great piece of research you can use to take the "consultative" path and save the day. This JWT/Ad Week survey is a perfect discussion starter, that shows how the average American sees advertising and describes the kind of advertising he or she likes and does not like. Show them the chart posted here and invite discussion. The public actually likes some kinds of advertising. 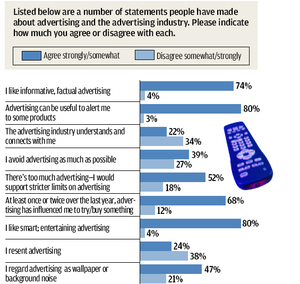 74% say they like informative factual advertising and 80% say they like smart, entertaining advertising. There are also very big negatives against advertising in general. Ask your client, in a nice way, if he or she thinks her ad creative is strong enough to overcome these general negatives. Ask your client if their ad creative is inline with what consumers find appealing. You should have the whole study printed out and in your bag in case your client wants to see more. It's only a few pages long and has nice easy to read charts. If your client's ad creative campaign succeeds you will have an easier time renewing the ad contract. Your time to act is before the bad creative goes to market. 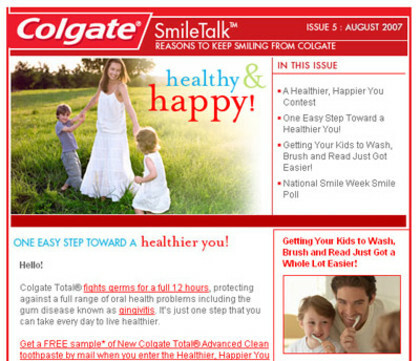 Stupid Marketing Watch: A Newsletter for Toothpaste? Just because your advertiser's message is delivered in digital does not mean it works. If your advertiser is about to do something really stupid it is your job to at least suggest another course. You are the local expert on your "Reader's Point of View." You need to know how they think, what they love, and what they will see as silly marketing hype. SmileTalk arrived in my Gmail account last week. “You are receiving this e-mail because you have signed up for the Colgate SmileTalk e-newsletter as [me]@Gmail.com,” copy at the top of the message said. Nonsense. It was unsolicited. I’m not sure where Colgate-Palmolive got my name and address, but I certainly did not knowingly register for SmileTalk. Even if someone forge-subscribed my address or I gave “permission” at some third-party Web site by overlooking a pre-checked box, the marketing group at Colgate-Palmolive should know better than to think anyone would truly opt in to SmileTalk. How do I know I simply didn’t forget opting in? Because it’s a newsletter about toothpaste, for &%@$#’s sakes.